This 3-hour indepth, personal session will teach you everything you need to know about Conflict REVOLUTION. Bring a conflict and we will plug it into the matrix. You will walk away with a personalized Action Plan for not just that conflict, but instructions on how to use Conflict REVOLUTION every day, with any conflicts you have. Does the chaos and violence in the world leave you feeling depressed, hopeless, confused, ineffective, or afraid? Do you long to connect with your passion and to find creative ways to express it in your life? Are you looking to create more balance in your relationships? Do you wish to experience your feelings in a more healthy and positive way? Do you want to learn to be more confident and competent in handling conflict? Are you ready to pick up your power and truly become the change you are waiting for in others? If you answered yes to any of these questions, then Conflict REVOLUTION® might be for you. “Con REV” is a revolutionary and highly-effective process that allows you to resolve conflict—any conflict—at its root within you. This is not conflict resolution, which focuses on the arena where the conflict is playing out. Con Rev® focuses on you and bringing peace to your inner life as you maneuver through that arena. 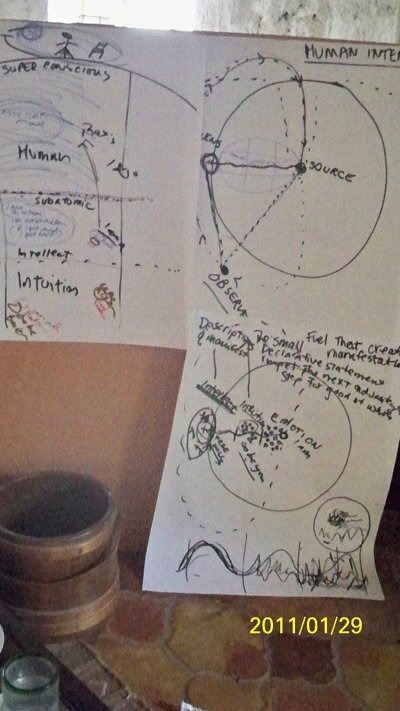 Maps of the Unified Field Theory and Human Consciousness from a workshop in San Antonio Texas in January 2009. The workshop begins with a fascinating presentation of Einstein’s Unified Field Theory, which produces a map of this inner life of human consciousness. This map then becomes your personalized step-by-step instructions, written by and for you to resolve your part of the conflict first from within. Inspiration to work the process on a daily basis. Using Con REV® to become the change, you will find within yourself the missing peace you mistakenly look for in others. Taking control of your domain improves mental and physical health, reduces stress, boosts self-esteem, grows discipline, and opens a clearer channel for Emotion to flow. Intuition can now be heard, as Intellect calms down and your entire system aligns to Compassion. Using Conflict REVOLUTION® you become the change. By making peace within, you will naturally make peace with your friends, family, co-workers, acquaintances, and you will be effectively contributing to peace on a global level. Barbara is available for one-to-one coaching as well as workshops and presentations. Steve | Colorado: “I became aware of Conflict Revolution at the Quantum Leap Celebration in Taos, N.M., in September of 2007. As Barbara gave her presentation I could feel a consciousness shift begin. After reading Imagining Einstein, the new additional perspective to my own on quantum mechanics of manifestation through Albert’s information initiated the change. As I began to actively practice Conflict REVOLUTION® with regard to conflicts as disruptive, contentious life situations, I referenced the material again and again, each time gaining some enhanced understanding. I realized that conflict was a function of the math of quantum mechanics of manifestation, not only a result. Sacha | England: “Oh boy! When I first started the Conflict REVOLUTION® Distance Learning course, I didn’t think I could do it. I needed to keep an open and honest journal which I had to share with Barbara. The first benefit I felt was just getting all of my issues out of myself and into the journal. Using the tools she gave me, I could see I was so wrapped up in nonsense that I couldn’t see the truth of myself. I was lost inside my pain and anger and bitterness. I had so much love inside me yet I couldn’t access this. The fact that Barbara actually showed me how to recognize I was projecting my issues onto others and that I was focusing on the minutia in order to avoid the reality of my life was astounding to me. Then there is the feeling and breathing, I swear this is the best bit! Holly | Oregon: “Barbara’s works, music and writings are moving and genuine. Her authority in her writing comes from her spirit, with a strong commitment to personal integrity and strength. I have been moved to action to take control of my own life by clearing emotional blocks and affirming the beauty and compassion of my own spirit. I can’t speak highly enough of the influence Barbara’s work has had on my life and on the lives of everyone she touches, and in the end everyone I touch, too. It truly is a commitment to ‘becoming the change you wish to see in the world’ when you commit to really understanding and putting into action the simple truths of Barbara’s work.